Every so often, someone asks me about my sweaters and replies with “You made that yourself? I thought you bought it! It doesn’t even look homemade.” I know the person means that as a compliment, so I politely say thank you and move on, but inside, I wince. Mass produced, store bought clothing are held up to be the best while handmade clothing is typically looked at as being inferior. Many people believe that the end goal of knitters, crocheters and sewists is to make something that’s as good as the store bought equivalent. When I think about it, that’s understandable. The average person is most familiar with store bought clothing and doesn’t know the virtues of handmade. What really makes me cringe is when I hear that comment coming out of the mouths of crafters. Have some pride in what you’re capable of! Handmade can be so much better than anything you find in stores. Makers have time and the capability to add so many small details that just aren’t profitable or possible with factory equipment. You can custom fit your garments. You can add time consuming details or hand stitch the perfect hem. You can choose the best combination of materials and create something unique. All of these things add up to why I love being able to make my own clothing. Sure, right now I don’t have the skills to insert a zipper perfectly, but I aspire to do it like a talented sewist, not a factory machine. This post is really just a jumbled mess of thoughts, and I didn’t have a real direction with it, but I’d love to hear your thoughts on handmade. Do you aspire to have your work be unrecognizable as handmade? What does handmade mean to you? I think you make a very good point. The problem is that when people say “handmade” they normally think of a not-too-skilled-but-making-do home crafter (which IS one type of home crafter, for sure), but they forget the other type: the extremely skilled artisan (an interesting example of how this is now the real luxury fashion in the Guardian the other day: http://www.guardian.co.uk/fashion/2013/mar/09/bespoke-clothes-take-over-fashion?INTCMP=SRCH). I’m sure no one would dispute that a “handmade” suit is better than a factory-made one. Perhaps we would need a new term, something like “home-made”. Usually when people are saying that “it looks better than handmade”, they are trying to say it looks better than “homemade” (which implies “sloppy”, “imperfect”, think Mrs Weasley’s pullovers). But that again poses another problem, as many things “homemade” are also very skilfully done, even when the person making them is not a professional tailor. I love hearing that, too. I was going to say exactly the same thing that fridica did. Those who compliment your handmade wares by saying that they look shop bought are generally trying to say: “It looks so good it could be high-quality RTW”. High quality mass-produced garments can be extremely beautiful and complex. And pricey to reflect the quality. But I know what you mean. All said, though, I’d prefer to hear that my garment looks good enough to be made by those who make things day in and day out and perfect the construction of a garment on a particular machine. I’m only making these things once or twice, after all, and the kinks come out in the practice. I find that homemade is what people are expecting and handmade is what a careful fastidious crafter actually makes. I think that this brings up the whole “craft versus art” debacle. While the technical definition of a craft almost always uses the words “skill” and “by hand,” people too often associate crafting with elementary school students using construction paper and pipe cleaners. That might explain why non-crafters always seem shocked to learn that the sweater I’m wearing is NOT made of construction paper and pipe cleaners, but rather something that looks stylish and wearable. I, too, kind of see it as a backhanded compliment, and I often think to myself, “I spent hours labouring over this for you to tell me that it looks like something I picked off of a rack of clothes at a mall? Puhlease, this is a 100% original labour of love!” It makes me feel like at the end of the day, the objective is to look similar to everybody else, and that handmade items are, by nature, ugly. Is saying, “it looks like you bought it,” supposed to be the same thing as “it looks there are no errors with your garment?” Since when should “handmade” be synonymous with “ugly” or “flawed?” Just a thought. There’s similar confusion surrounding “craft” in classifying craft blogs. I consider this to be a craft blog because I do more than just knitting, and everything I do is technically a craft, but when people think craft blogs and search for them, the low-skill, do-it-in-an-afternoon kind of crafts tend to be what people are expecting. 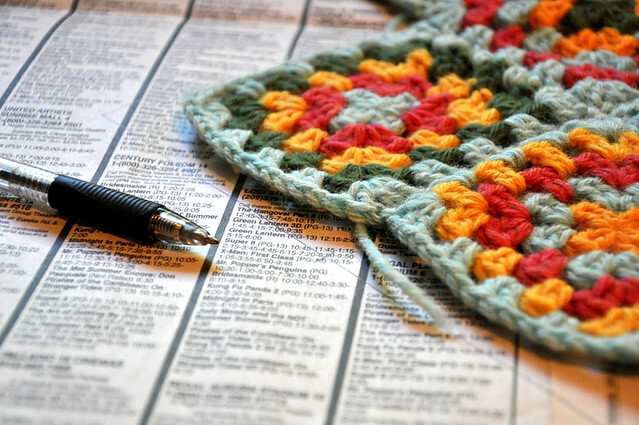 Sewing and knitting blogs often get put in the design blog category. It’s interesting how the word has evolved. By the way, I love the cardigan you’re wearing in the photo! Is it handmade? If so, what’s the pattern? That’s it! Thanks for linking to it, Alison. Thank you, it is now favourited! These are really interesting questions, Andi. Have you read this post by Alexandra Lange on the New Yorker site about the differences between the nineteenth-century Arts & Crafts Movement and the current public perception of craft? When someone tells me that one of my knitted pieces looks storebought, I usually interpret that to mean, as Fridica says, that it looks professionally made (whether by hand or by machine)—so I strive to make things that elicit those types of compliments. But I agree with you that handmade opens up a world of artistic possibility. The question for me is, how do we shift the public’s idea of “handmade” closer to “heirloom”? If I was to say, it’s couture, designed and made just for me … I don’t think they’d say it looks like it was from a shop … nor that they’d scrutinise the workmanship … does that make sense? I guess there’s a snobbery that I feel we’ve got to overcome about handmade/homemade. There is a romantic notion about making your own things though that harps back to wartime/post war fashions. There’s so much of it on our screens right now. It’s encouraging. I like the term handmade over homemade, too, but I don’t really know why. Handmade covers more, including professionals as you mentioned, but homemade can involve the same level of skill. This made me immediately think of my grandmother! While she hasn’t sewn in years–she has horrible arthritis in her hands, but is always telling me how amazed she is that I knit and sew–she used to make all of her own clothes. She’s a funny spitfire of a woman, and when she was younger she lived on a farm with her family, moving from the country to what used to be a very flourishing city. The absolute best comparison is Radiator Springs in Cards. My home town is just like that. I love making things by hand because they’re both better and worse than store-bought items. My knits aren’t perfect. I love that about them. Most people couldn’t tell some of the things that bother me like a messy seam or a cable that’s crossed the wrong way. But I like that. I’m not a machine! So I don’t want to make something that looks like it’s from a machine. But at the same time, my clothes are made with better materials and more thought when I make them myself. They’ll last a whole lot longer. I kind of like the flaws, too. I like seeing my learning curve when I decide which sweater to wear in the morning, and they remind me of the human touch like you mentioned. I like to think of handcrafted as in the same league as couture. Essentially we are crafting something by hand to fit the recipient as perfectly as possible. Why would I want something factory made when I can have couture? I think handmade items are the best! No doubt about it. When someone takes the time and effort, buys the yarn, etc, and makes it thinking about you, it’s the best positive item of all! Store-bought is way down there, not even on my list. THANK YOU! I totally agree with. I think so many sewists now are obsessed with making their handmade garments look factory made. I used to be on this bandwagon until I got into 1940’s sewing and I realized that sewing was not so much a hobby back then, but a necessity. A skill that women could use to get ahead, to stay afloat, to provide for their families, etc. Being a seamstress was something to be proud of! Not a dorky hobby reserved for grandmas. Hey andi! This is hummingbirdkrista, I added you on ravelry a few weeks ago; Anyways! I got into sewing when i was younger and I really havent gotten to do it enough to get very good at it..
One day ill make dresses like a pro. I’ve encountered something a little different from you. Many people in my life know me to be a knitter. So sometimes when I wear a store bought sweater, I get asked if I made it! I’m more embarrassed when I have to admit that I didn’t make something than when I have to explain that I did. But I do understand where you are coming from. Many people don’t have the skill to make themselves clothing, so it doesn’t occur to them that handmade clothing can look so clean and well fitted. When the opportunity presents itself, I like to tell them how much time it took and how many times I ripped in order to get it to look the way it does. I think we’re at the point in history where most people are so dependent on store-bought clothes that they no longer know how to make their own, which is why self-made clothes usually ended up a bit wonky. And not that long ago, only those who are unable to pay to have their clothes made for them, made their own. I guess that is why handmade are usually regarded as inferior to store-bought. I agree with a lot of these thoughts. There seems to be a lot of effort in the blogging world to make stuff that’s nice but “doesn’t look homemade,” which is such an odd thought given how gorgeous and special handcrafted things often are. I think this is a really important discussion. In my mind, I’ve made a distinction between “handmade” and “homemade” where homemade implies a certain lack of skill and quality, whereas handmade reflects artisan quality. The definition of craft is so broad, and so full of crappy handmade items these days. Just because it is handmade doesn’t automatically make it good or better. I personally refer to the higher quality craft /handmade….which I think I would place your sweaters….. As fine craft or artisan, thus seperating it from the church bazaar type stuff.